Ecological influences on species are often thought to be transient, but many species and clades exhibit adaptations that persist over macroevolutionary timescales. I aim to better understand when and how local ecological factors leave a macroevolutionary signature. In my work, I combine field studies of organisms in nature with a phylogenetic comparative approach to ask how ecology shapes large-scale patterns of evolution. I primarily work on the genus Anolis, an ecologically and morphologically diverse radiation of arboreal neotropical lizards. Below, I describe several key elements of my research. Matched Anolis species that evolved on different Greater Antillean islands. Anoles diversifying on four islands repeatedly colonized the same adaptive peaks on a shared evolutionary landscape, resulting not just in convergence among a few species pairs, but in the convergence of entire island anole faunas. Top row depicts giant tree crown specialists Anolis cuvieri (Puerto Rico; photo by J. Losos) and A. garmani (Jamaica); second row depicts the twig specialists A. garridoi (Cuba) and A. occultus (Puerto Rico); third row depicts trunk and ground specialists A. cybotes (Hispaniola; photo by B. Falk) and A. lineatopus (Jamaica); fourth row depicts grass specialists A. alumina (Hispaniola; photo by M. Landestoy) and A. alutaceus (Cuba). I am interested in the factors that underlie convergent evolution, and deterministic patterns of evolution more generally. Radiations of Greater Antillean Anolis are famous for the evolution of ecomorphs – ecologically and morphologically similar sets of species that have arisen independently on the different islands. In a study published in Science with coauthors Travis Ingram, Liam Revell, and Jonathan Losos, I showed that convergence in Greater Antillean anoles is not simply a feature of some species pairs, but that the entire anole faunas of these four islands are deterministically similar despite largely independent histories of diversification. Convergence of entire evolutionary radiations appears to be due to diversification on similar macroevolutionary adaptive landscapes, an idea that had been previously proposed, but not investigated at macroevolutionary scales. Our study of the macroevolutionary landscape in anoles reveals some interesting insights about macroevolution, suggesting that peaks on this landscape can be stable for long periods, and that larger geographic areas (which host richer radiations of species) permit the landscape to be explored more thoroughly. Check out media coverage of this work here, here, and here, plus a summary by coauthor Jonathan Losos for National Geographic here! 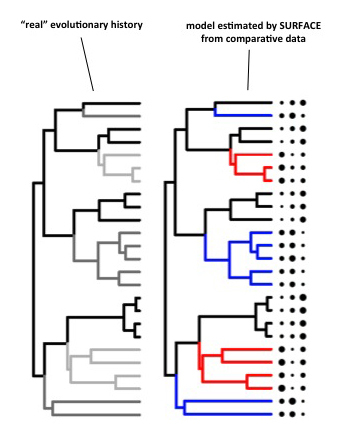 I’ve collaborated closely with Travis Ingram for this research, and the two of us recently developed a new comparative method for objectively detecting phenotypic convergence without relying on an a priori hypothesis about which lineages are expected to have converged (Ingram and Mahler 2013; see also below). 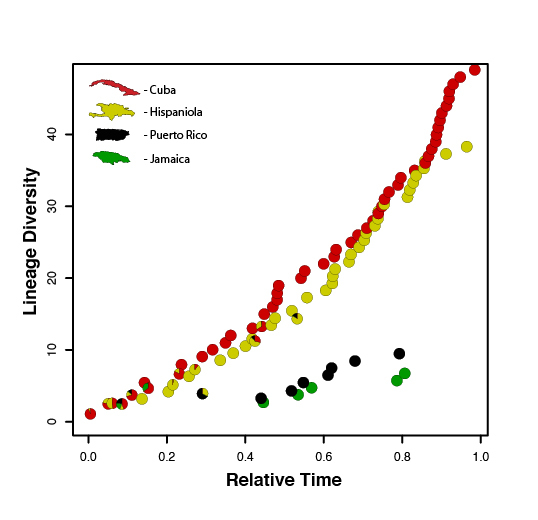 Anole lineages (y-axis) accumulate at different rates on different Greater Antillean islands over time (x-axis). Region-specific diversity of lineages is one way of measuring ecological opportunity. Ecological opportunity is another of my major research interests. According to the ecological opportunity hypothesis, ecological traits should evolve rapidly as clades expand to fill new niches, but more slowly as available niches become filled. I’ve tested this hypothesis in Anolis lizards. Ecological opportunity is rarely quantified in macroevolutionary studies, and when it is, it is typically represented as a simple function of time, even for lineages that periodically colonize new regions and radiate. With colleagues, I recently introduced a method for measuring ecological opportunity as a function of region-specific lineage diversity. We showed that for Anolis lizards radiating across a geographically complex archipelago, the rate of evolution is highest when lineages first radiate on individual islands, but declines as lineages accumulate over time – support for the ecological opportunity hypothesis. This work is described in an Evolution paper (Mahler et al. 2010), and I’ve investigated or reviewed the ecological opportunity hypothesis in several other papers (Pinto et al. 2008; Losos and Mahler 2010; Revell et al. 2012). Currently, I am investigating whether evolutionary responses to ecological opportunity tend to be graded, or whether evolutionary changes are concentrated at those branches of a phylogenetic tree that correspond to major shifts in ecology. The comparative approach is vital to testing hypotheses about macroevolution, and I’m interested in the development and application of novel phylogenetic comparative methods. SURFACE is designed to locate convergent shifts to similar phenotypes on a phylogeny. In this example from Ingram and Mahler (2013), a “real” history is presented on the left, and the SURFACE model estimate on the right. Spheres denote values for three traits. Using the tree and this phenotypic information, SURFACE correctly identifies those lineages that have converged (i.e., those with same shading in the left tree). This interest is empirically motivated and, with colleagues, I’ve developed new analytical tools for investigating many of the questions that drive my research. In 2010, I introduced a method for estimating historical ecological opportunity at the nodes of a phylogenetic tree (implemented in coauthor Liam Revell’s “phytools” R package). More recently, I collaborated with Travis Ingram to develop an algorithm for detecting multidimensional convergence on a Simpsonian macroevolutionary landscape, given a phylogeny and continuous trait data. This approach, which we call SURFACE, is described in a paper in Methods in Ecology and Evolution, and is implemented in a stand-alone R package. We used this technique to study convergent evolution on the macroevolutionary landscape in Anolis lizards (see above). I’m particularly interested in phylogenetic comparative methods for continuous traits, and for the past two years, I’ve lectured on this subject at the annual Bodega Bay Workshop in Applied Phylogenetics (for more information, including notes and tutorials, see my Teaching page). My interest in biology stems from a lifelong love of organisms (especially reptiles and amphibians) and information about the natural history of lizards forms the foundation for much of my work. 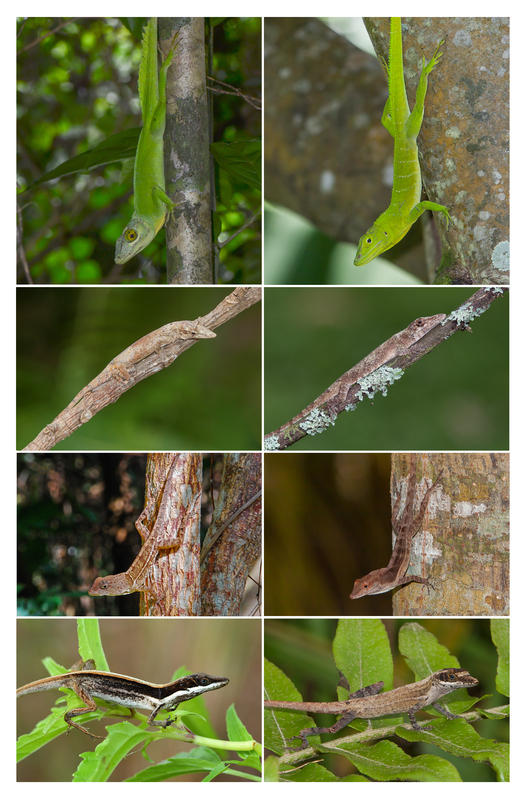 I study the morphology and ecology of Anolis lizards during field expeditions throughout the neotropics, and this work has led to new discoveries about the natural history of species (e.g., Mahler and Glor 2011; Losos et al. 2012; Stuart et al. 2012), and even to the discovery of previously unknown species (Mahler et al., in review). 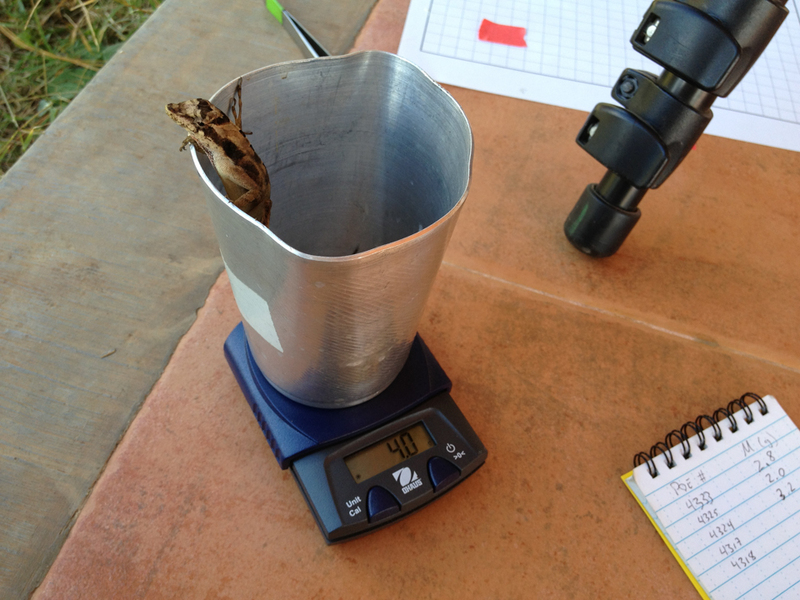 Taking data on Anolis lemurinus in Chiapas, México.